I want to keep up with my running mileage while keeping my sanity this month. I’m working on finishing up my PhD in Chemistry and things are getting crazy and it seems like there aren’t enough hours in the day for everything! I know I will feel better if I get my workouts in. I just have to keep telling myself this and trudging along! The idea of a non-scale related goal is amazing. I know that I, too, have lived my life defined by a number that I hated. My goal is to do some kind of exercise every day in April. I’m not going to confine myself to only one exercise, because I know I’ll be traveling twice this month, so I’ll have to be flexible and find ways to make it happen. Thanks for the reminder that a goal doesn’t need to revolve around a number! Backless, huh? I’ve got a long way before that would happen for me. Good for you! I actually have two goals for this month! One is to run a 7k, which is coming up this Saturday. And another is to get my mile time down to 15 minutes. That’s still much more than I want to be eventually but I think it’s a good goal by the end of the month. Thanks for the reminder that it’s not always about what’s on the scale! My goal is to track my calories using My Fitness Pal–if I can’t search for it or scan it, I won’t eat it! I have the exercise thing down as a non negotiable habit–but I will always be fighting my temptations to eat right, use correct portions and stay accountable!!! I started having surgeries on my left knee when I was 14, after nine surgeries, and other various types of treatment, I’ve found it hard over the years to stay strong and fit. It was hard not only because my knee is very weak and arthritic, but because I felt like every time I really started to work at my health and fitness, I’d have another surgery or treatment, and I’d be back at square one. Finally, last year, watching the two of you conquer your fears on the biggest loser and regain your lives back, I was inspired to do the same. I started with a trainer, and aqua size classes, walking, and a trainer who was willing to accommodate to my unique knee problems. To date, I’ve lost 40 lbs, and am a healthier, fitter, happier self that I was a year ago. However, despite the fact that I’m not looking to loose more weight, not weighing myself on a very regular basis causes me more than slight panic. I hadn’t considered the idea of working to achieve a non scale related goal, and I LOVE IT! My goal is to stop putting myself down and concentrating on what I can do instead of can’t do. My goal is to run a mile without walking. I’m tired of doubting myself! I like this idea very much because sometimes the scale feels out of my control. I never know what it will do. But other goals I feel like I can make everyday choices to accomplish or not to accomplish so I like that better! My goal is to log my food consistently. Consistency is the big point right now because I seem to do well one day and then not the next. This pattern replays over and over again and I believe consistent logging will make a difference for me on this journey! I have the same problem… I lack consistency and discipline. Guess I will join you on your non-scale goal. P.S. Wishing you the best on your first half marathon! Woohoo! I had a short-term goal this week. In Costa Rica the Easter week is a big holiday and we get the whole week off, which sounds nice, but considering that my gym is across the street from my school, my goal was to get up and get my bootie to the gym the three days it would be open (even if I wasn’t at school). I DID IT! I did my full workout in the three days and have a plan to do a 5k walk DVD the rest of the week. My other challenge is to stay on my eating plan….I’m doing ok with that too. Thanks for being such an inspiration – love ya girls! 1. GRADUATE NURSING SCHOOL in August!!! 3. Shed this nursing school weight ASAP! 15 pounds in 8 months is unacceptable!! Running my first 7K this weekend with my friend, we’ll see how it goes! I’m a nervous nelly! I have not been preparing myself for this yet due to school taking over my life… it’s a spur of the moment thing! I’m all about non-scale goals because quite often the number on the scale each week isn’t indicative of how hard I’ve worked. My non-scale goal this month is to work on my speed with running. Speed work scares me but I know I can do it! 4. to climb Mt. Kilimanjaro. I’ve thought about the being-on-time and I’m not totally failing … especially since I just started a new job, so being on time is a necessity … and plans for mountain climbing are slowly building. But it’s good to be reminded about the enthusiasm and the generosity: I’ve been too lazy for both lately. My nonscale goal is to jog a 5k on Mother’s Day. I walk this 5k every year, but since January I have lost 31lbs and while continuing on that journey, I want to jog it. I have been doing walk/jog intervals at the track 5-6days a week. My other nonscale goal is to get better at logging my food. Jessica and Ramon have shared some awesome info from the ranch with me, on the right types of food to eat, and I was writing everything down, but have been slacking off. So, it’s back to writing everything down, every day, no excuses. For the past two months I’ve been working out at a small group training gym, Get In Shape for Women. I LOVE it. I feel much stronger, have been seeing some great results and finally have been able to finish all the ab exercises without dying! I have dropped a ton in body fat percentage but my weight isn’t going down as fast as I’d like. So my non-scale goal for the month is to write down what I eat, and ALL of it…even if its bad….FOR REAL this time. Good luck ladies! Just signed up for a 5 mile race in a month! Seriously, it’s like you guys can see into my brain sometimes! Truth be told, I’ve gotten so frustrated by the slow, SLOOOW going on the scale recently that I’m beginning to lose sight of the fire that I had for the first 55 pounds of my weight loss journey. So I tried switching up my cardio, but I’ve been battling some injuries. Maybe someone upstairs is telling me to take a second look at my nutrition, rather than my workouts? 😛 I think so. There’s a goal! My goal is to consume my dishes without any added butter for the rest of this month. In a ricemaker, a good taste alternative for salted butter is tomato, but tomatoes are expensive and I have to time their addition carefully so that the ricecooker neither undercooks nor overcooks them. My non-scale goal this month is to make it through my marathon training and keep my eating under control even with stressful life events coming up. I love your blogs, and I am so glad you’re posting more often!! Can’t wait to see the outfits for Finale! I’m in my 4th week (out of 8) of boot camp & I’ve been slacking off like nobody’s business. I’m probably the mentally weakest person there. My goal is to actually DO what I know is good for me – to follow the meal plan & do the workouts. I’d also like to start the C25K running program with my husband. That was supposed to say out of 8 weeks. My non-scale goal is to not stress about weightloss. I tend to get a bit crazy with every calorie and I think that stress is working against me. I also want to blog more and really look within and examine why I do what I do. Hannah and Olivia, you are so inspiring. My two sisters, mom and I love you and are all working towards our goal weights. Wow, this is such great timing- over the past 13 months I have lost 106 lbs and I am down to losing my last 10-12 (I’m currently 8 lbs over my healthy bmi). I’m 5’5 and 158 lbs, but I’ve always had a pretty large frame. I am really proud of how far I have come- I’m a runner now instead of a couch potato:), but it is so hard not to get obsessed with the scale when you have such little left to lose and you just want to get there. I struggle with knowing what number to aim for- obviously I want to get under my bmi- but other than that I am fine with how I look- but I do not want to sell myself short either. How did you figure out what your body’s ideal 5lb weight range is? I’m about to tackle a big goal next Saturday. My first 1/2 marathon! About 2 yrs ago, I would have laughed at you if you asked me if I was a runner. Today, I can say YES and I really enjoy it! 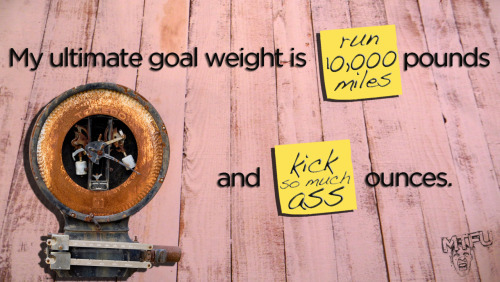 Funny you bring up the idea of a non-scale related goal, because that’s exactly something I’m working on right now. I was going to do another 5K run this year, but my husband challenged me to run the 10K instead. My original plan was to only run 5K’s until I reached my goal weight. Well, at 175 (and 35 lbs from my goal still) I was scared to try and double the running distance. I’ve been running on and off for 2 years now, starting at a 16:00 mile. My main reason for not challenging myself was also because in the past I’ve had a hard time sticking to my calorie budget when I exercise intently. That has changed. I am in the middle of training for the 10K and am still losing weight. Race day is May19th and as of today my longest run is 5 miles, and I know I’ll reach that goal. The scale is also moving down along the way. Glory! My goal is to try cross fit. I need a jumpstart…so I am giving it a try. My April non-scale goal is to have more toned abs! I guess I have a really good one!!! Since I was borne I suffer with asthma, so I never could run, not even when I was a pro athlete. Nowadays I’m one a new treatment that allows me to run, but I’m just so afraid that I panic on the second step… It’s time to overcome this fear and just run!!!! How about a 5 km this year? This is perfect for me right now. I’m early in a pregnancy with my second child but I’m noticing I ate much better the first time around. My non-scale goal (since really, I shouldn’t be AS worried about the scale right now as just being healthy) is to up my daily fruit and vegetable servings.